The good thing about this trek is that occasionally i am joined by someone else and today my good friend Paul King will be walking this section with me. He had dug out his rucksack which was once green and had now turned yellow and donned his old boots, he certainly fitted the part of a seasoned walker. 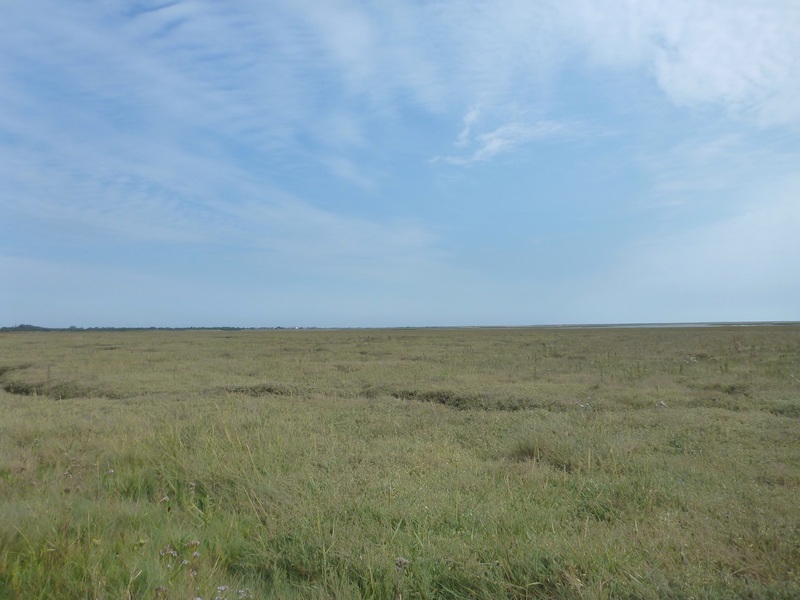 Susan dropped us off today at this side of Pagham Harbour as it would be just as quick to walk across the harbour than driving around. The sun was shining at the start of the walk and was quite warm, however a few fair weather clouds were beginning to form above us. The short walk across the fields from our drop off soon took us back to the Crab and Lobster where i had finished last time. We were so tempted to go and have a pint in the garden here, but being the fact that we had only just started probably would not have been a good move. From Sidlesham we joined the tidal path that went closest around the harbour and good timing again meant that the tide was going out so the path was easily accessible. Some bits of the path were quite muddy and others bits had the reeds taking it over, you also had to be careful here (as we found out) and that is that you could easily wander off on a worn looking track thinking its the path, but it’s not and you would end up having to double back as it would come to a dead end, fortunately we only went about a hundred metres before we realised that we were wandering further in to the harbour. The great thing about Pagham Harbour Nature Reserve is that it’s so peaceful even with the many different calls of the migrating wild fowl, i wonder if they can understand each other or whether they speak a different language, however the harbour is very much a glorious haven for the many different species of bird that either settle here or use it as a stop off on their long journeys. This area attracts many bird watchers and occassionally you would read in the paper that a rare bird had been spotted here, however, today it was particularly quiet, there was not many people walking around it or even twitching. 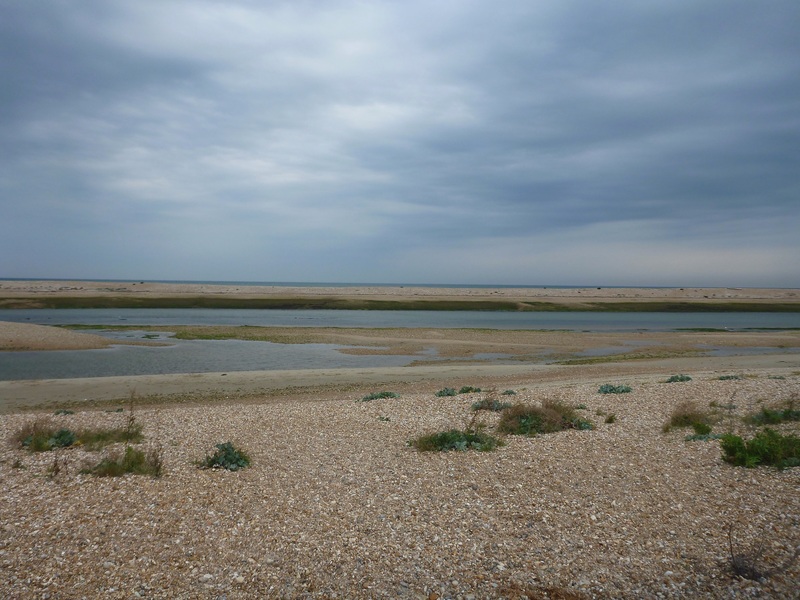 We soon rejoined the path on the Pagham Harbour wall that was to take us back East and lead us to the route that takes us past Pagham Lagoon and the South side of Church Farm holiday village. There were now a few more walkers out with their dogs, probably from the caravan park. 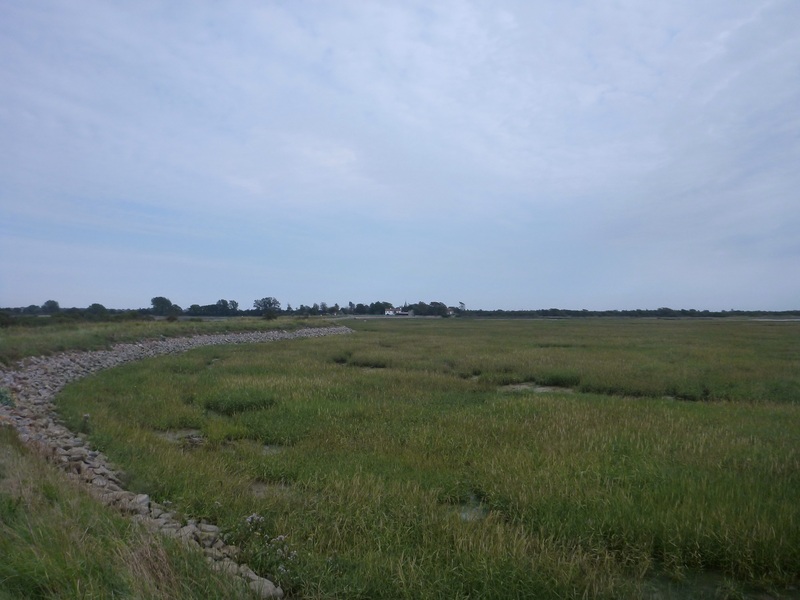 Once we had walked all the way around the harbour we were back to the sea edge again and we could see the mouth of the harbour and the tidal water rapidly flowing out, i’m sure they have done lots of work here as it was different to how we remember it as kids. From here it was to be a short walk up Harbour Road to the part of Pagham village where there is an amusement arcade, souvenir shop, cafe and a sailing club it seemed as though it had not changed here since i frequented these amusements in my courting days when i met Susan thirty two years ago. Brought back some great memories and led to a great reminiscing session with Paul King. 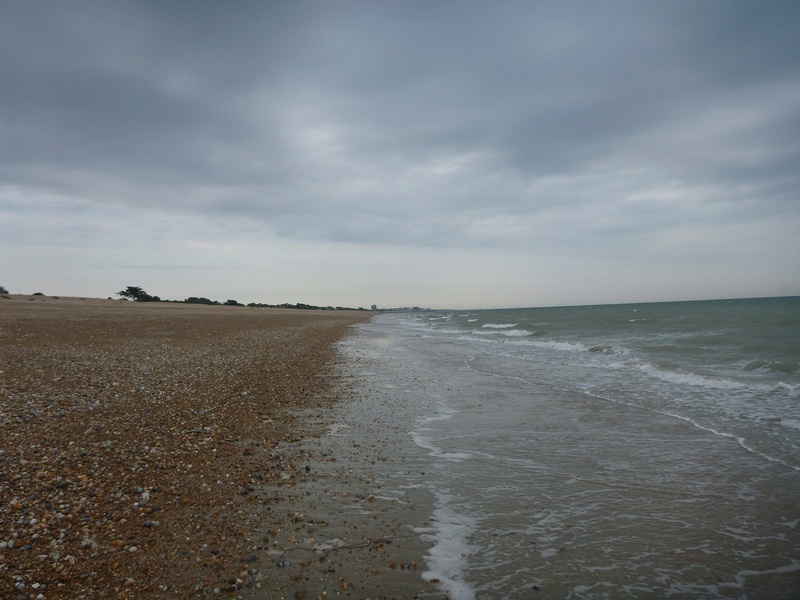 The tide was becoming quite low now which meant that we could walk along the beach and follow the coastline right back to Felpham now. 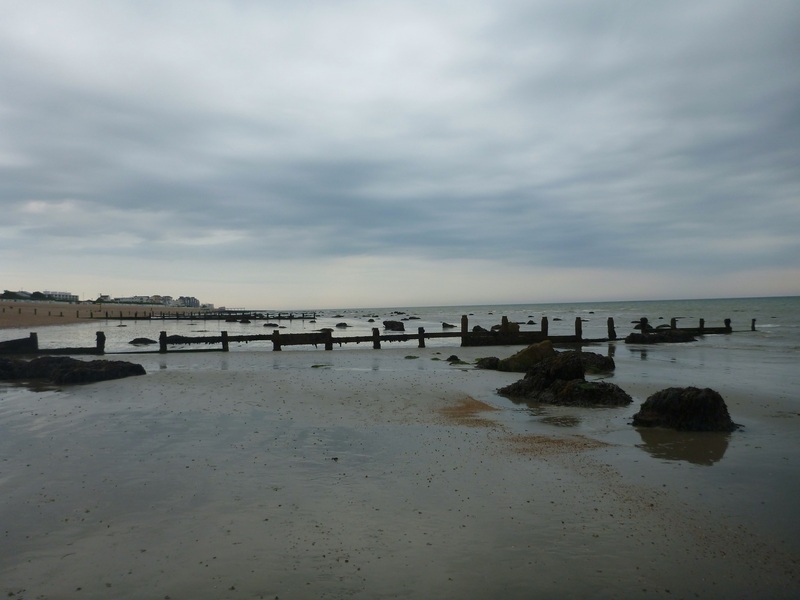 We walked right down on the waters edge and could see Bognor pier in the distance, it was now an easterly wind and quite a strong one at that, however it wasn’t cold. 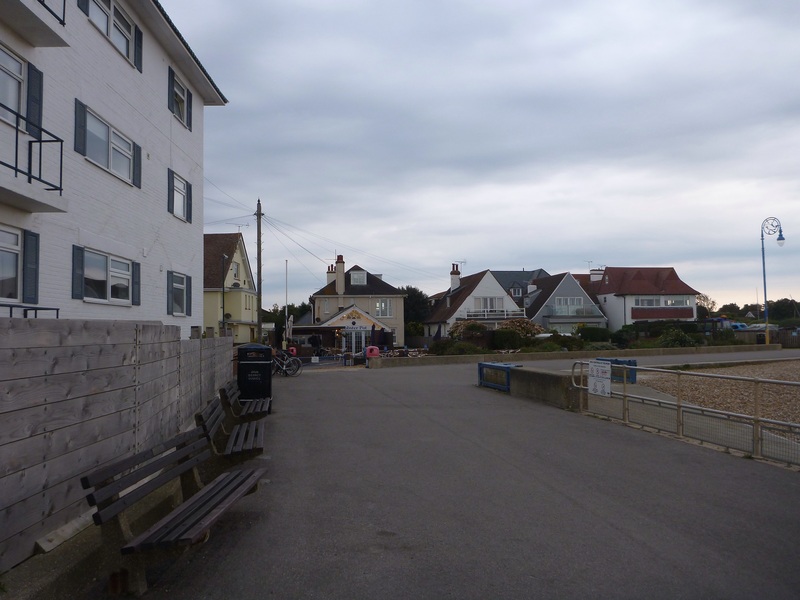 The walk took us in front of many residences and ultimately to the the promenade at West End. 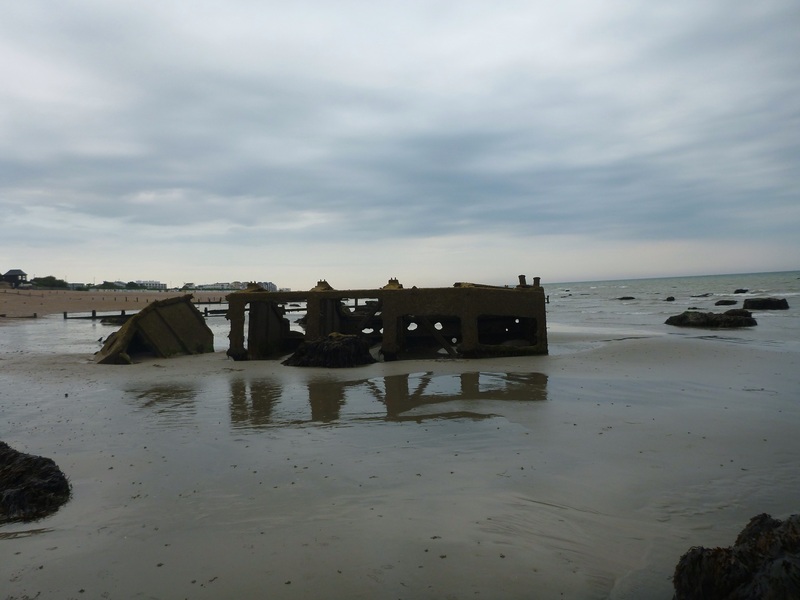 Just before reaching the promenade we came across the wreck of a Floating Pontoon which was once part of the Mulberry Floating harbours used by the Allies to invade the French coast on D-Day 6th June 1944. This particular section was a part of the Mulberry Harbour which broke free in a storm on 4th June, the day before it was due to go over the channel to Arromanche. 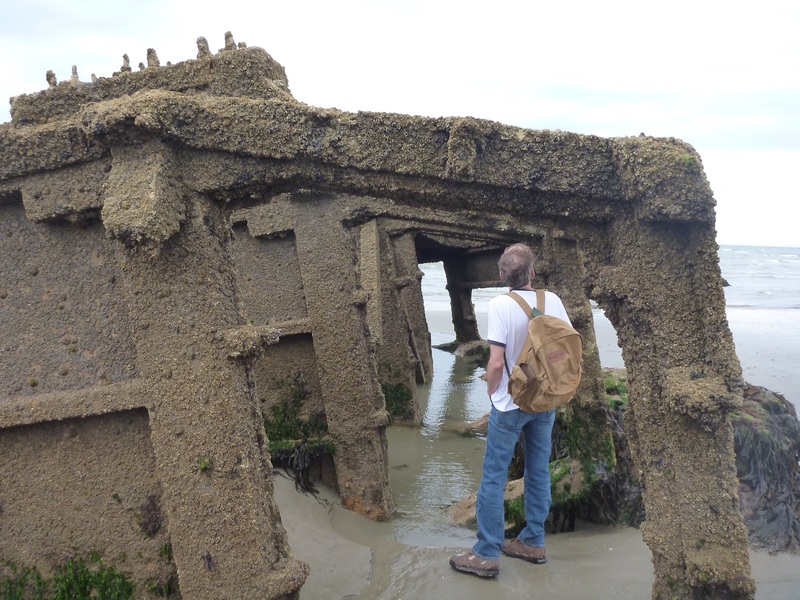 This particular section of Mulberry was abandoned and it was washed up on the beach shortly after D-Day. It is clearly visible at low tide which was great as it enabled us to have a good look around. 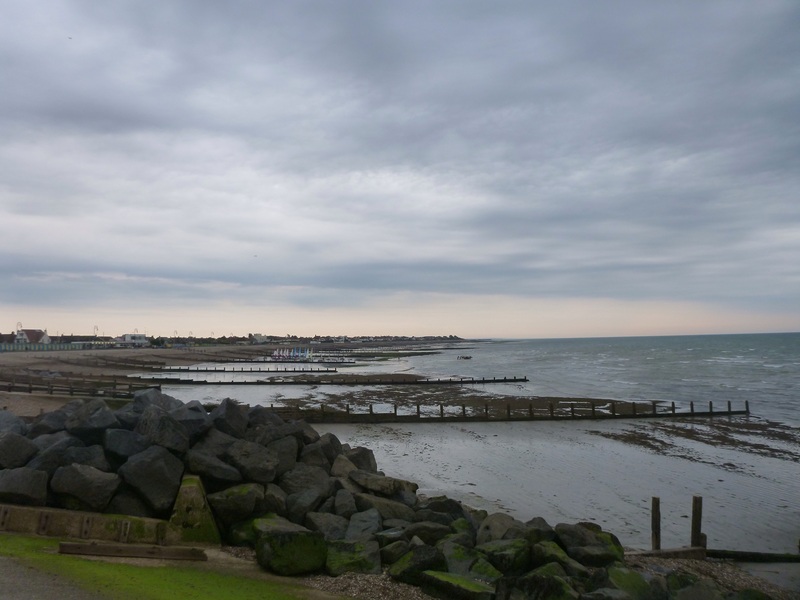 We felt a few spots of rain and was hoping that it wasnt going to come to much as we did not have our waterproofs with us, so we headed up to the promenade, where we could easily shelter (in a pub) if need be, but fortunately it did only turn out to be a few drops. From Aldwick the walk took us along the promenade past many sites that have changed over the years to the pier, or part of a pier as it is today. 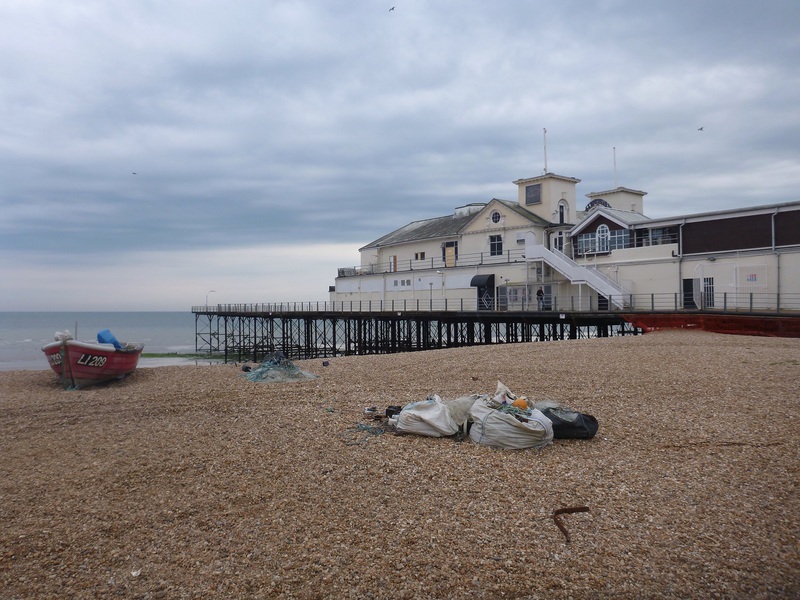 Various storms over the years has seen parts of the pier be destroyed and only a small section remains of the splendour it once was. From the pier a short walk along the promenade at Bognor Regis, past the bandstand takes us to Butlins Holiday resort, a major tourist spot that has been attracting holiday makers since it opened in 1960, albeit that it has changed considerably over the years and it is now distinguished by three large hotels and a marquee type structure. 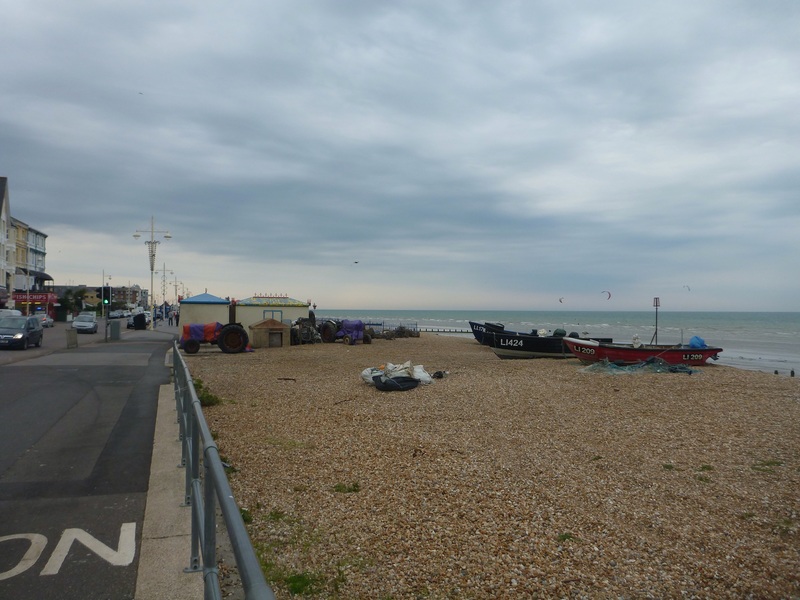 Butlins is built on land that divides Bognor Regis and Felpham. The trek today has been another massive milestone as i have now achieved walking along the entire coast from Bournemouth Pier to my home village of Felpham and the last corner that we turned before stopping for the day meant that in the far distance i could ultimately see the white buildings of Brighton and the goal for 2015. The day was concluded by having a meal at the Lobster Pot, which is a cafe during the day and a restaurant in the evening during the summer months, I couldnt think of a better way to finish the day than with a bottle of Peroni, Crab Bruschetta to start, followed by a main course of Lobster Linguine and all with the sights, sounds and smells of the sea…………Perfect! !